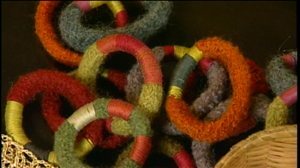 We are thinking thin on this episode of Knitting Daily TV, and no, it does not have to do with dieting. This episode features all the creative possibilities of thin yarns. Eunny explores all the uses of thin yarns beyond lace. She shows techniques for ruching, gathering, and making ruffles. Download tips and trick for better knitting from guests and experts on Series 400. Eunny is on location with our very own Kristin Omdahl with a shawl from Kristin’s book Crochet So Fine (Interweave, 2010). Download of Kristin's Swirl Waves Shawl, shown in this episode. Kristin demonstrates more techniques for crochet lace and shellwork stitch patterns. Download the Friend Shawl pattern from Coats and Clark and Redheart Yarns. Mags Kandis is back with a funky bangle project using thin, fine yarns as embellishments over even the chunkiest projects. This cute bangle pattern comes from Mags' new book Gifted (Interweave, 2010). Download the Bevy of Bangles pattern.